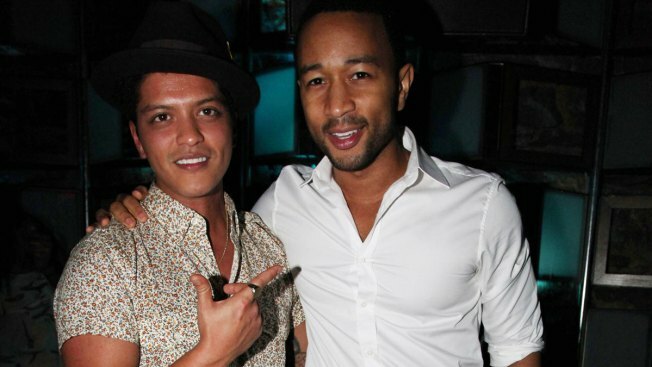 Bruno Mars and John Legend attend the Sade & John Legend concert after party at SL on June 21, 2011 in New York City. Legend and Bareilles each earned acting nods for their roles in NBC's "Jesus Christ Superstar Live In Concert." Mars earned a nomination for outstanding music direction for his first TV special, CBS' "Bruno Mars: 24K Magic Live at the Apollo." Benj Pasek and Justin Paul are also on their way to EGOT status: The composing duo earned a nomination for outstanding original music and lyrics for "In the Market for a Miracle" from Fox's "A Christmas Story Live!"